The dragon here is the mythical beast from China, not the lizard-like figure of Western imagination, but more a snake with legs and whiskers. And where do Chinese dragons come from? There is a gorge called Longmen ("Dragon-gate") on the Yellow River that flows so fast it is said that any carp that managed to swim up it will turn itself into a dragon, the King of the scaly beasts. A very matronly Kannon, the Goddess of Mercy, stands barefoot amidships on a rather nice dragon. In her left hand she holds a flower (perhaps a lotus flower), while the dragon similarly clutches the symbolic Chintamani Stone (or "treasure ball"). Four dragons rally forth, looking quite angry, and each clutching its Chintamani magic stone. The four represent the four colours of the cardinal directions: white (W), blue (E), black (N), and red (S). The full Japanese title is 四龍天昇, literally "Four dragons heaven rise", and the box also has the Chinese for "Four dragons" (Si long). The brush name Nablange is affiliated with the Kokado graphic art studio. Whereas the western concept of a dragon is like a giant lizard, the Japanese dragon (like the Chinese one) is more of a giant snake with four legs. As in this picture, it is capable of flight, and can be quite coiled up; here it also carries its cintamani magic ball, which seems at last to have found the end of a rainbow! Over a sea of tumultuous waves, gold and siver dragons face off, each clutching an auspicious Cintamani stone. The panel above is made from two separate puzzles by the Chinese artist Song Qijin: White cloud tiger and Blue thunder dragon listed separately below. You can also combine these two vertically. The blue dragon in Chinese mythology is the protector-god of the west. In this dramatic portrait, he boasts the sharpest teeth and claws, and clutches the usual chintamani magic crystal ball. Mount Fuji towers in the background. Song Qijin (宋其金) is a Chinese-born digital artist, affiliated with the Kogado Studio (name in the original Chinese order, Song is the surname). 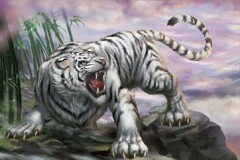 A very fierce-looking white tiger, in Chinese mythology the protector-god of the west. 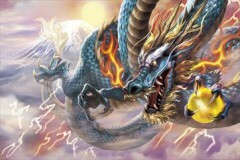 The tiger, symbol of fire, and the dragon, symbol of water, are often portrayed as adversaries, representing the heaven-earth or ying-yang dichotomy. Note that the tiger is quite naturalistic, whereas the dragon is an entirely mythical beast, and more like a snake with legs and horns than the giant lizard form of Western dragon. This puzzle is also available in 2000 pieces (code A20047). The painter Ozuma Kaname was born in 1939, in Niigata. He studied traditional Japanese art, and his pictures are generally based on traditional themes. Ozuma is his family name: he signs paintings with the single character of his given name only. The classic duo from the four protector gods: the tiger quite naturalistic, but the dragon a fantastic scaly snake-like body with fierce fangs, talons, and horns.